A lot has happened since I last posted. We moved from Bay St. Louis, Mississippi to Robertsdale, Alabama. It’s very nice here and super weather today—84 degrees with a good breeze. Beautiful trails to walk, so the pups are loving it! 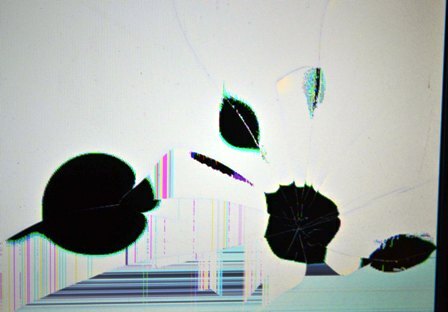 Unfortunately, when we were settling into our new site my laptop was damaged. The image to the left is what you see on the lower right screen when turned on. 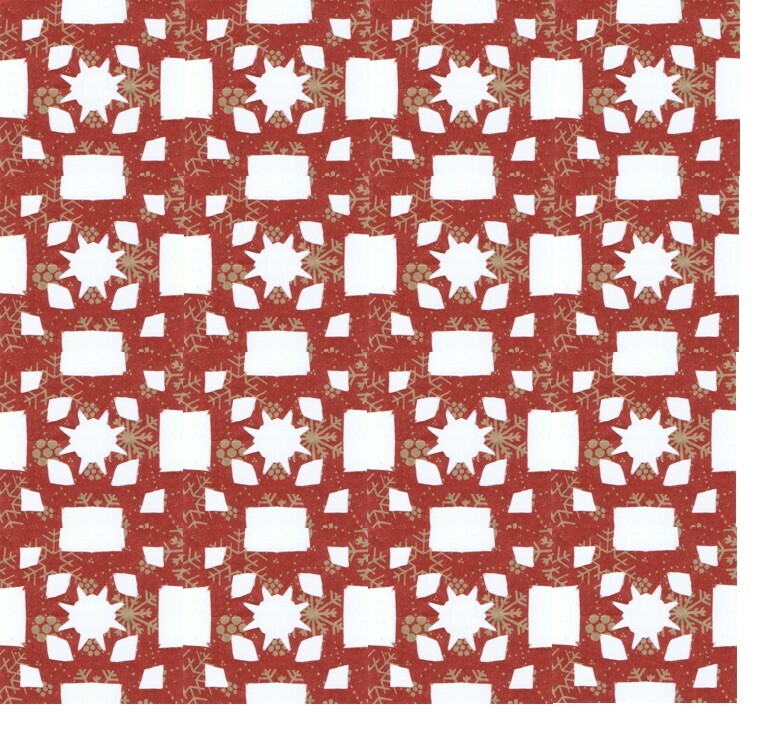 I think I’m going to create a needlepoint design out of the pattern. Needless to say, this has had an impact on my internet presence! I’ve started a new class. Sharon Boggon’s Studio Journal: a Designer’s Workhorse. Yesterday began Week Four. I have been busy reading, completing the exercises, and working with my journal everyday. 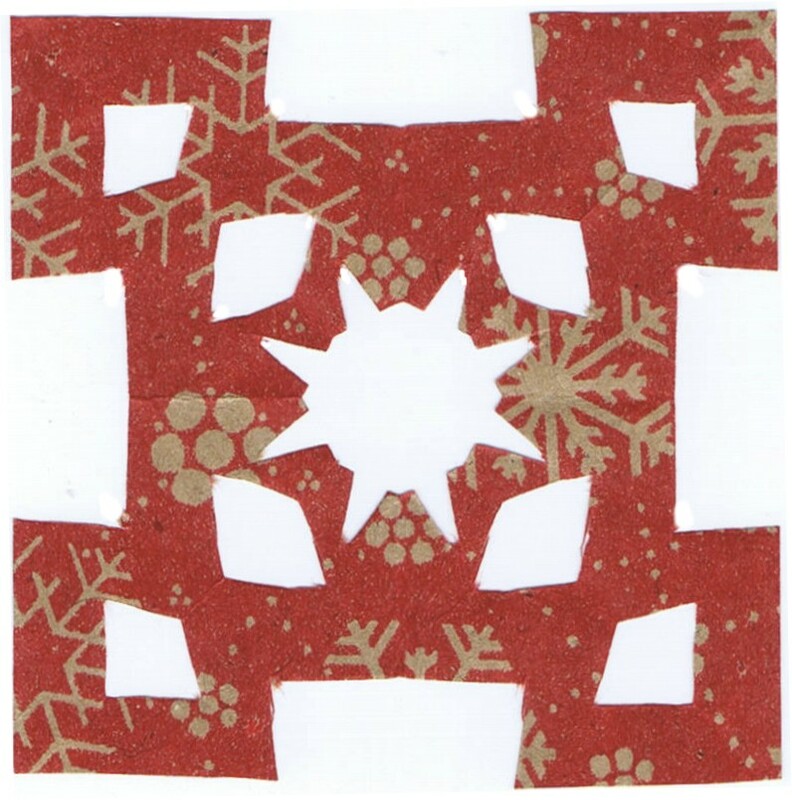 Following is an easy, but fun example of an exercise from the Studio Journal course. Hopefully in the future you will see designs that flow from the exercises I’ve been doing and from the creativity using the journal inspires! TAST has taken a back seat during the weeks for detached chain and chain stitch, but I’m back on track with this week’s Couching Stitch. Taking the Journal class is pulling a lot of loose ends together for me. 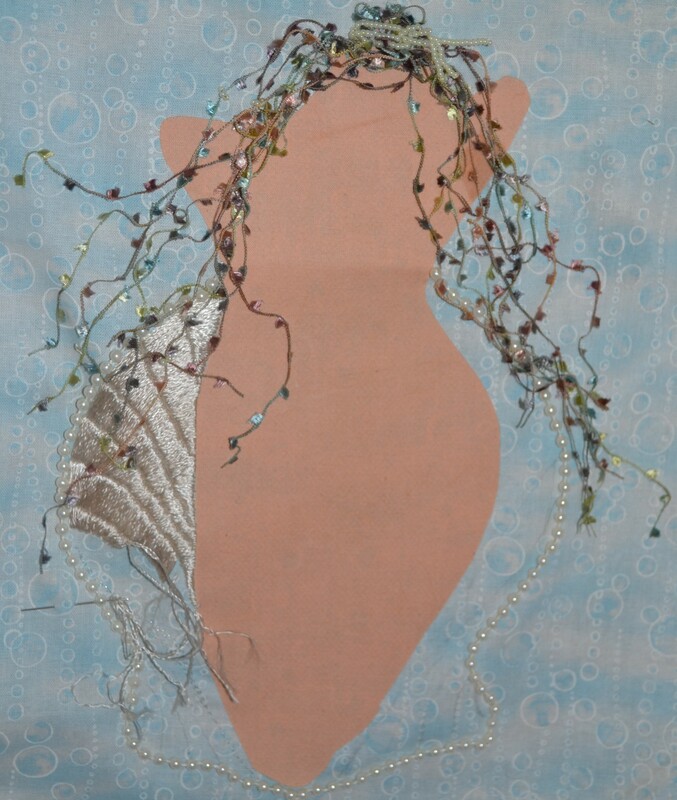 My sample of TAST’s Week 9 stitch led me to pull out an old UFO, Venus de la Mer. 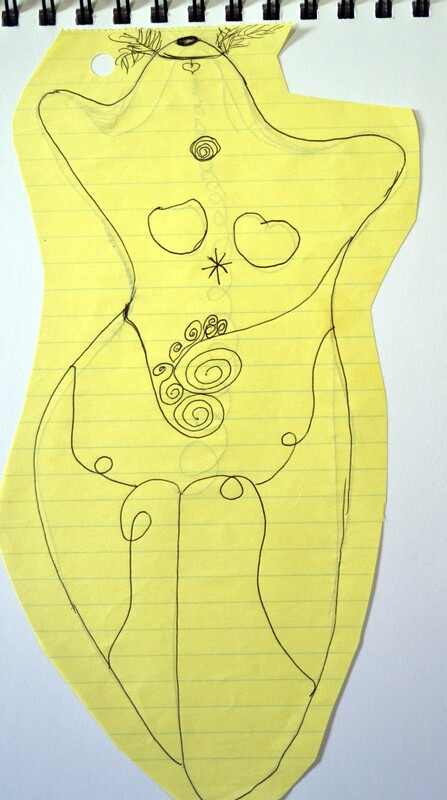 I once did a doodle of a Venus of Willendorf incorporating Chakra points. I liked the doodle so much I decided to turn it into an embroidery piece. I couldn’t decide if I wanted her to be represented with elements of Earth, Air, Fire, or Water, so I decided I would do four pieces, one for each element. I started with Water since I had some cool water fabric to use as a background. I’ve now put the original doodle in my journal where it will be safe and I can easily find it again. 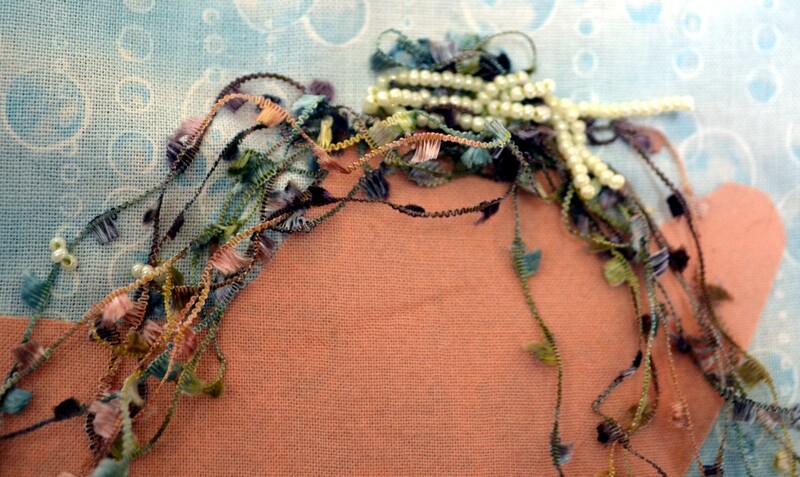 And, I couched the eyelash thread hair in place, using some seed beads for embellishment. When Jeff looked at it and asked what I was doing and what was I using, I asked him what he thought. He said, “It looks like weeds.” Mission Accomplished!! 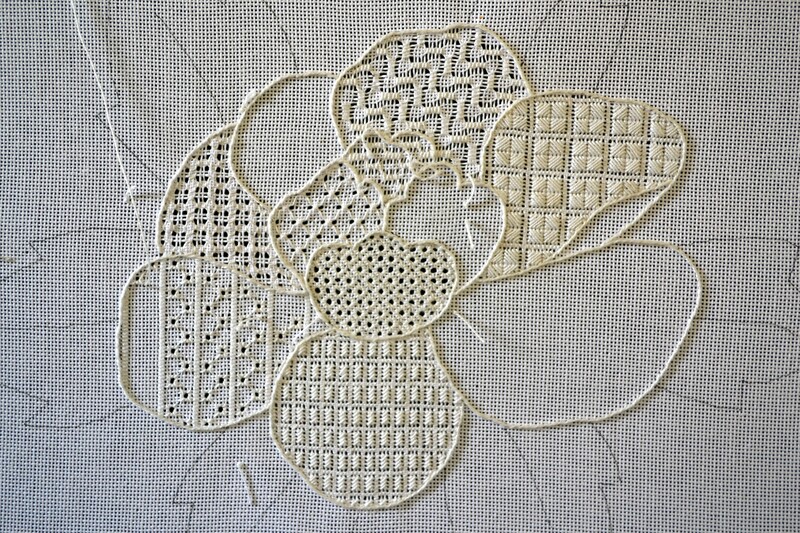 I’ve also been working like crazy to finish an ANG class, Snow White Peony. It is due on March 15. I think I can finish it. But even if I don’t, I’m going to send it in to the instructor for feedback. A certificate of completion would be nice, though, especially since I’m interested in pursuing Master Stitcher qualifications. What do you think? Is it doable? You would think that since I’m pulling this sample from a previously worked canvas, the post would have been done immediately! Procrastination is thy (middle) name! 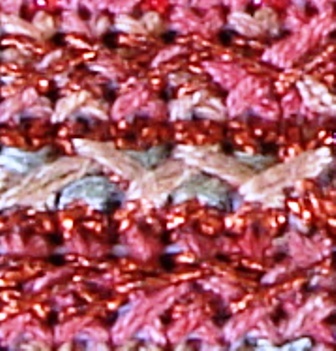 The Take a Stitch Tuesday 2012 fifth week challenge was the Herringbone Stitch. 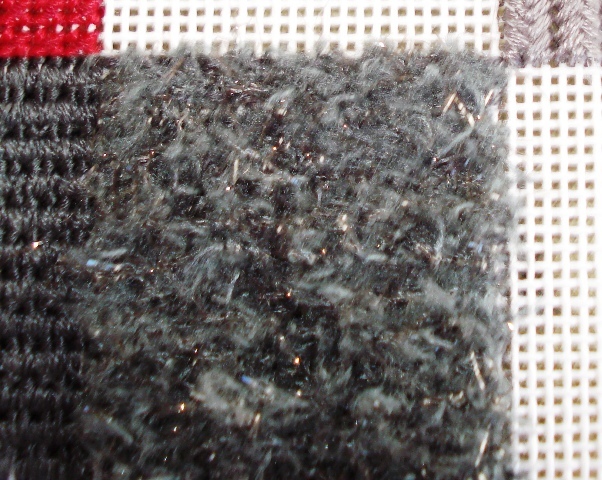 This is another stitch I like. I find it interesting that a number of others taking this challenge report not liking this stitch, nor any of the others we’ve been working on. This is not surprising, the first five challenge stitches are related. Like one, like ’em all; and vice versa. 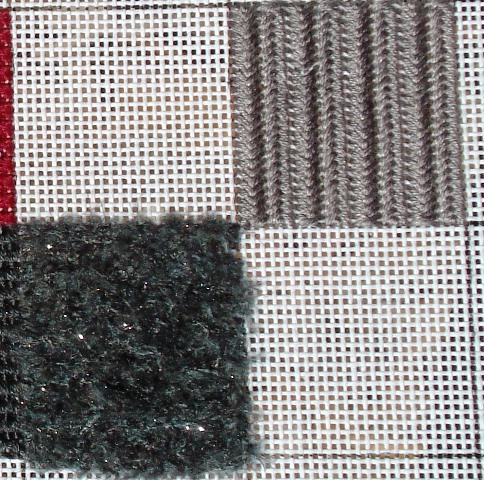 This is called Four Way Herringbone because it is worked in four journeys. 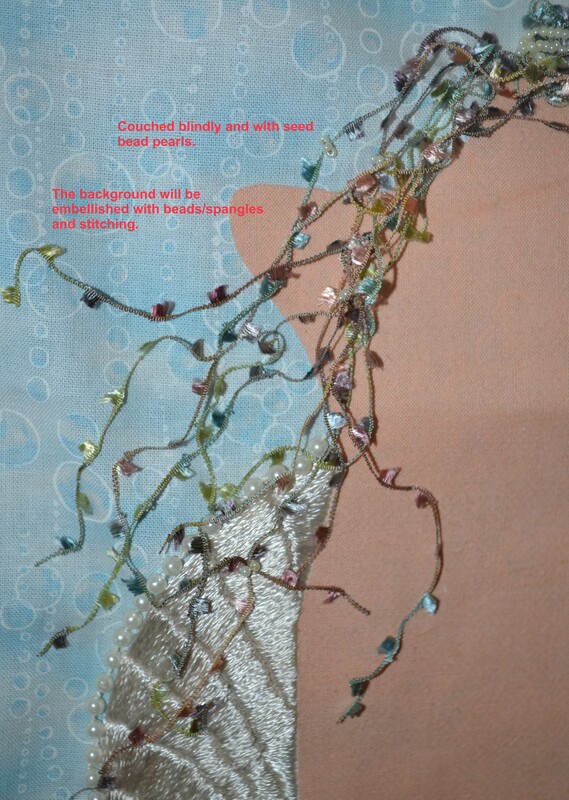 I’ve used four shades of DMC Pearl Cotton and Krienik Braid provides the shine. 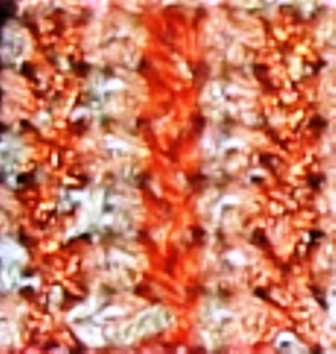 You can find the directions for this presentation of Herringbone in the plans for Pat Timpanero’s Honey, I Shrunk the Heart. 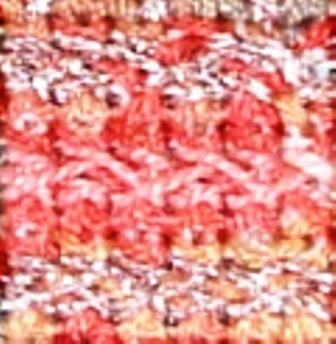 This was the American Needlepoint Guild’s Stitch of the Month for December of 2000. 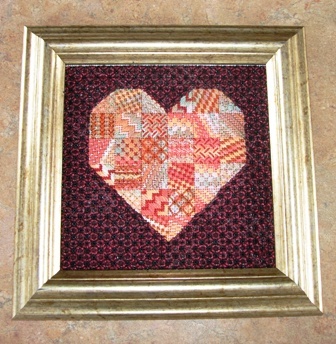 The overall design has three squares done with the Four Way Herringbone. See if you can find them in this picture. I’ll give you a hint—one is vertical and two are horizontal. I’ve already shown you two of them! Look closely! Give it a try! And let me know what you think!